Children of Chaos is the first book in Dave Duncan’s Dodec series. The title of the series derives its name from the world in the novel, which is in the shape of a decahedron. The world and the characters within it are captivating. I am definitely looking forward to the next book in this series, Mother of Lies. Dave Duncan has a wonderful ability to pull readers in and make them care about his characters and the world they live in. While some writers seem to stop the action to explain the back history, Dave Duncan keeps the story going. His facts are as important and interesting as what his characters are going to do next. Children of Chaos is a fantasy novel, with warriors, priests, priestesses, lords, ladies, royalty, peasants, slaves, gods and goddesses. There is intrigue, magic, oppression and power. 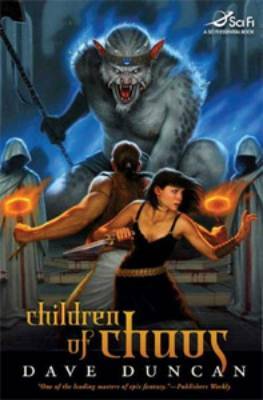 Without telling you what happens, I’m sure if you have ever enjoyed reading a legend, a mythology, or a fantasy novel, you will enjoy Children of Chaos. I highly recommend it.